It is easy to find a trade supplier offering a wide range of kitchen designs and if you have time to browse you will eventually get what they want to sell you at a price most likely above your budget. At 4Shires we know for builders and buy-to-let owners, time is money. 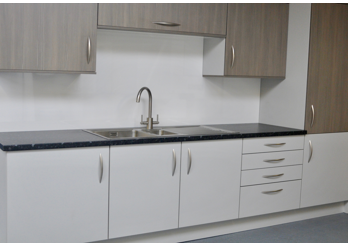 So, to help make your kitchen decision easier we offer a limited range of high-quality standard kitchen designs suitable for most renovation projects. 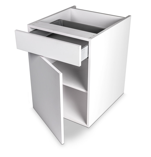 Our kitchen units are supplied fully assembled, with soft close hinges as standard. The doors and drawer fronts are factory fitted ready for installation, saving time on site and giving a better product, which is built to last. Each unit and door has a 10-year guarantee. Come and visit our Rugby showroom and see one for yourself. Alongside our kitchen display you will find samples of doors, handles and worktops to help you select the look and finish that is right for your space. Our customer advisors will be on hand to answer any additional questions you may have. If you are a small, medium or even a large builder who is looking for /themes/4shires/images/kitchens your customers will love, you are in the right place. We deliver quality /themes/4shires/images/kitchens where you want them at a price that is right for you.